Are you a window washer? Have you been injured in a high rise window washing accident in NYC? You may have a claim for a lawsuit. 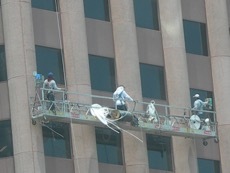 Under the statute, a building owner, lessee, agent or manager will be responsible for the harm to any window washer who was injured while working at the building and was (1) not provided any safety device; (2) was provided a device that was not approved by the board of standards and appeals; or (3) was provided an approved device that failed because the device was not properly maintained. If either Labor Law §240(1) or §202 have been violated, a window washer will be able to bring a claim against those responsible. In addition to claims under the Labor Law, there may be additional claims, such as a common law negligence claim, that can be brought on behalf of an injured window washer. Determining each and every possible claim and determining who is at fault for a window washer accident requires a thorough understanding of the various laws of New York and New Jersey. The NYC window cleaning accident attorneys at Gair, Gair, Conason, Rubinowitz, Bloom, Hershenhorn, Steigman & Mackauf have vast knowledge in these areas of laws. In fact, the firm’s attorneys have been asked to lecture time and time again to other attorneys, judges and other legal professionals on the various construction laws. If you or a loved one has been seriously injured or killed as a result of a window washing accident, it is critical to speak with an attorney who has a firm grasp of the various construction and labor laws. The New York window washing lawyers at Gair, Gair, Conason, Rubinowitz, Bloom, Hershenhorn, Steigman & Mackauf have an abundance of experience in representing injured window washers. Please contact us today.